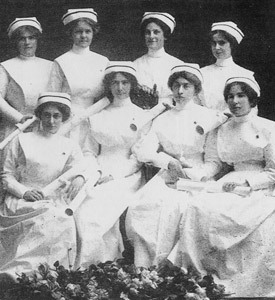 This project explores a critical episode in the history of Nursing education in Canada through the lens of collected oral histories, drawn from the Sisters of St. Joseph, and other significant community members, who functioned as educators and administrators at the renowned St. Joseph’s School of Nursing (1911-1972), Hamilton, Canada. As chief oral historian to this project, my role includes: research, oral history collection and production. This project has evolved in collaboration with the St. Joseph’s School of Nursing Alumnae Association’s archives committee, and has been officially acknowledged by: the Congregation of the Sisters of St. Joseph’s Canada, St. Joseph’s School of Nursing Alumnae Association, and St. Joseph’s Healthcare, Hamilton. Project content is currently being digitized for public access. This entry was posted in The St. Joseph's School of Nursing Oral History Project on October 10, 2013 by mberenyi.